Russian Video: In Memory Of Igor Tkachenko (Russian Knights Commander)! International Aviation and Space Salon MAKS 2009 opened today. Visitors watched magnificent performance in the sky… But today I want to show you what they did not watch: The aerobatic group Russian Knights whose commander colonel Igor Tkachenko was killed 16th of August when two Su-27 fighters collided during a training flight before the opening of the MAKS 2009 Air Show. We will remember you, Igor! This entry was posted in Memory, Science and Technologies on August 18, 2009 by admin. He lived a Hero, he died a Hero. Far better than lesser mortals (like me, perhaps) who gaze skyward in awe but never get to touch it. May Igor’s soul rest in eternal peace. 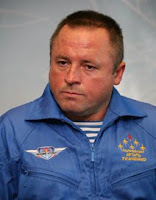 I’m a Flight Controller 64 years old and I have an extreme passion as the Russian Knights perform the flights,since the training.I’ve talked about Russian Knights to my Flight Control colleags and bosses too.Russian Knights are “FANTASTICS”. Наша дань и незабываемым должное этому Авиатор .СЛАВА Игоря !